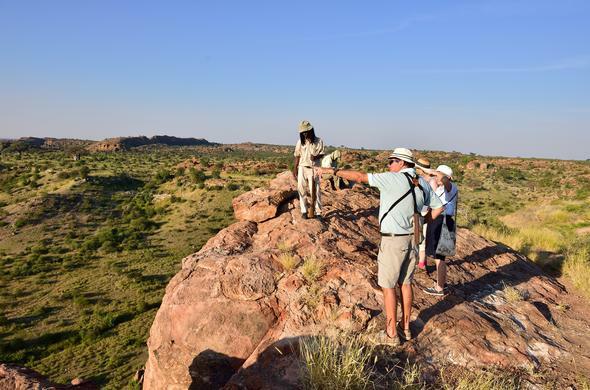 While in Limpopo don't miss the opportunity to head back in time and explore the historically rich cultural heritage site known as Mapungubwe. Located at the top of the Limpopo Province, on the border of South Africa, Botswana and Zimbabwe, where the Limpopo and Shashe Rivers meet, one will find the beautiful Mapungubwe National Park, a nature reserve and World Heritage Site.A predominantly Venda speaking area, Mapungubwe is known for its extraordinary history and was once the home of an exceedingly advanced African nation that lived in the area between 1200 and 1270 AD. The Kingdom of Mapungubwe was the first step in the development of the community that would later go on to create the powerful Kingdom of Greater Zimbabwe in the 13th century.Venturing into the reserve, visitors should take the time to stop at the Mapungubwe Interpretation Centre where they can learn more about the area's history and view the famous golden Rhino that was found on the site.Mapungubwe is incredibly historically important as the community that lived here are considered to be the most complex society in southern Africa at the time and also the first class-based social system in southern Africa. Walking around the area one will clearly see the signs of social ranking separation as the leaders were separated from the rest of the inhabitants, living on the hill and looking down on all below them.There are a number of settlements in the reserve where the people lived at different historical times. The largest settlement is known as K2 or Leopard's Kopje culture. The K2 people, who moved into the area due to the strong attraction to the agricultural possibilities, were probably descendants of the eastern Bantu people. The K2 settlers hunted the Elephants in the area for their tusks, a valuable source of ivory and a popular trading item and it was their control of both the ivory and gold that lead to their immense powerful and wealth.With the availability and access of a wide variety of resources, the community at K2 grew in sized and strength and soon the population was too large for the area and in 1220 the people left K2 and relocated to Mapungubwe Hill.A visit to the Lost City ontop of Mapungubwe Hill will allow you to gain insight into the community that lived there, and you will be able to learn about their culture and way of life while taking in the beautiful view that stretches out before you.The landscape is made up of strange sandstone formations interspersed with mopane woodlands, riverine forest and tall ancient odd-looking baobab trees. Rich in a variety of wildlife, visitors to the nature reserve can look forward to sightings of Giraffe, Elephant, Eland and Gemsbok and might even be lucky enough to spot some of the predators including Lion and Leopard.